However there is a subtle difference between yoga postures and ordinary stretching exercises. “Yoga exercises are different from general regular exercises in many ways. Normal exercises are mainly done for burning the calories and releasing the excess energies. Yoga is for releasing the tensions and emotions by aware movements… Yoga is not just muscle stretching exercise. It is more about mild inner massaging of the glands, diaphragms and the joints. Hence, put more awareness to your movements.. Exercises are like prose, whereas yoga is the poetry of movements.” (From the book Yoga and Vipassana : An Integrated Lifestyle By Dr. Amit Ray). I prefer to take a walk in the neighboring park during my lunch break. But often I feel, we need more than that. Right posture is very important for sitting long hours at the office desk. You need to adjust the position of your chair, computer and desk for maintaining the natural curve of the spine while sitting. Utilize the chair’s lumbar support and adjust the height of the computer screen to keep your head and neck erect. Your feet should be placed flat on the floor. If they’re not, use footrest, which will allow your feet to be at a level that’s comfortable. Don’t cross your legs, as this can cut off the blood flow and cause problems. Sitting firmly in your chair, stretch both arms over your head and reach for the sky. After 10 seconds, extend the left hand upwards and then the right hand. Sitting in your chair, lift one leg off the seat, extend it out straight and hold for 5 seconds; then lower your foot, – stop short of the footrest and hold for ten seconds and then place it on the foot rest. Do the same for the other leg. Place both hands on your side and slowly lift your bottom off the chair, holding your weight on your hands. Lower yourself back down to your seat. Do this for ten times. Relax your neck muscles. Join both the hands together, raise them upwards and place them behind your head. 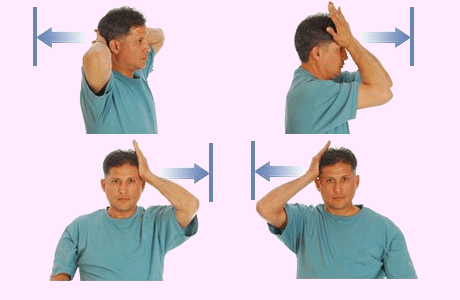 Push your head backward against your hands while pulling forward with your hands so your head does not move. Hold for 10 seconds. Relax your neck muscles. Join both the hands together and place them against your forehead. Push your head forward against your palms without moving your head. Hold for 10 seconds. Place your left hand against the left side of your head. Push your head against your palm without allowing it to move. Hold for 10 seconds. Place your right hand against the right side of your head. Push your head hard against your palm without allowing it to move. Hold for 10 seconds. Place your left hand against your left temple. Try to bring your chin down to your left shoulder without allowing your head to move. Hold for 10 seconds. Place your right hand against your right temple. Try to bring your chin down to your right shoulder without allowing your head to move. Hold for 10 seconds. Try these exercises at your desk. Your body will remain flexible and there will be lesser probability to develop diseases like frozen shoulder or back pain. This entry was posted in Articles, Yoga, Yoga Life Style, Yoga Postures and tagged exercises at office desk, neck exercises at office desk, stretching exercises at office desk, yoga at office desk. Bookmark the permalink.